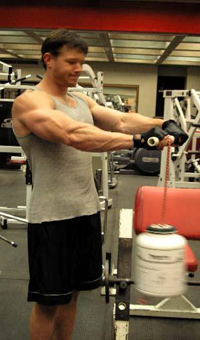 -The primary purpose of the bean bag wrist roller is to improve hand and forearm muscular strength and endurance. -Bean bag wrist rollers capitalize on teaching by invitation by allowing students to quickly and easily modify resistance by adding or removing small items (e.g., bean bags, baseballs, golf balls) from the bucket. -The bean bag wrist roller makes a great fitness station. -Most of the items used to make the bean bag wrist roller can be found at any hardware store. 1-Punch two small holes, one in the bottom of the bucket, and on in the buckets lid. This can be done with an electric drill or simply a screwdriver if a drill is not available. 2-Feed the rope through the lid and the bottom of the bucket. 3-Tie a large knot at the end of the rope so that the rope does not slide through the hole in the bottom of the bucket. 4-Punch a hole through the center of the PVC pipe. Do Not go all the way through the pipe. This part will probably require and electric drill. 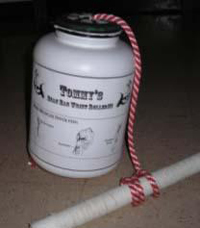 7-Wrap the PVC pipe in athletic tape to reduce slippage on the hands. 8-Add or remove bean bags from the bucket to increase or decrease resistance. Submitted by Thomas V. Nenos from Ridge, NY. Thanks for contributing to PE Central! Posted on PEC: 3/11/09.